christytomlinson: New She Matters 2015 Summer Retreat! awe friends!! !, I have been holding in the news for like a month now and have been bursting at the seams to tell you about me third and final She Matters retreat for 2015! If you follow me on social media, you know that back at the first of December, I flew to California to take a class from the lovely Stephanie Lee. It was a metalsmithing class and something I had NEVER done before. EVER. We were using torches and solder, flux and metal and all sorts of cool tools that I thought only professionals could use. I couldn't believe I was going to learn all this stuff! I had pretty high expectations for the class and then I was pretty much just blown away the entire weekend. Seriously I think Stephanie got tired of me saying.. NO WAY!.. SEriously? SO freaking COOL! I mean I was constantly in awe, when she would do a demo on something new. I couldn't believe WHAT is capable with a little solder a torch and some metal! Seriously! I had THESE best time of my life! Hands-down the most information learned all year. IN one little class. So at lunch the second day, I quietly begged her to PLEASE come teach with me during a she matters retreat for 2015 and she agreed! We have been working on the dates and I am so excited to finally announce it! And I left happy because I had actually MADE somethings that I was SO proud of! and I couldn't believe, Honestly I had made them!! Stephanie will be joining for our Summer Retreat, August 8th- 4th! Many of you have asked me to do a summer retreat.. so HERE YOU GO! As with all my other retreats, this is an ALL inclusive retreat! EVEN all your metalsmithing materials! Normally at my retreats we have two days of class and one free day. This retreat we will have 3 FULL days of teaching! 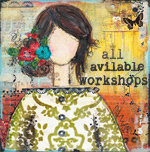 Stephanie will teach two days of necklace/earrings and bezel making.. and then I will teach the third day, a she art girl class! This will be EPIC! plus we will get to enjoy the long summer days and nights here iN idaho.. under the beautiful lights outside my studio! It's MAGICAL here in the summer time! you can check out ALL the details On THIS page..
where you can see what's included (everything basically expect your airfare/travel). What to expect, that's in store, the food, the pampering, the goodies we will be making and more! Hope you will join us! I KNOW this class is going to fill up fast! no doubt! This is one class.. all year, that you will NOT want to miss. Plus it is my last She Matters Retreat here at my home for 2015. So if you have been wanting to come.. NOW is the time! Is this retreat in N. Idaho? I live in Spokane WA. What is the cost? How fun!! That will be so great. where do you get the chains for your pendants? love them they are so unique!